The best way to think of a call debit spread (a.k.a. bull call spread) is as a long call with an added hedge of a short call. 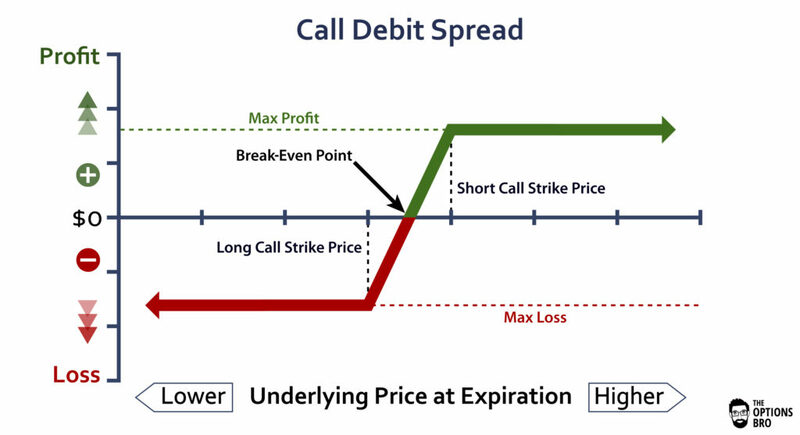 The short call component of the call debit spread reduces the overall delta and theta of the position. Although the short call component limits the max profit of a call debit spread, it’s a useful hedge to an outright long call position. Out of every online broker with 24/7 customer service in 2018, Ally Invest the has the lowest commissions to trade the call debit spread strategy as well as the best free options trading software. Read the Ally Invest Review. Note: like most options strategies, call debit spreads can be traded in-the-money (ITM), at-the-money (ATM), or out-of-the-money (OTM). By placing this trade, it creates a net debit of $0.30 ($30), hence the name “debit” spread. 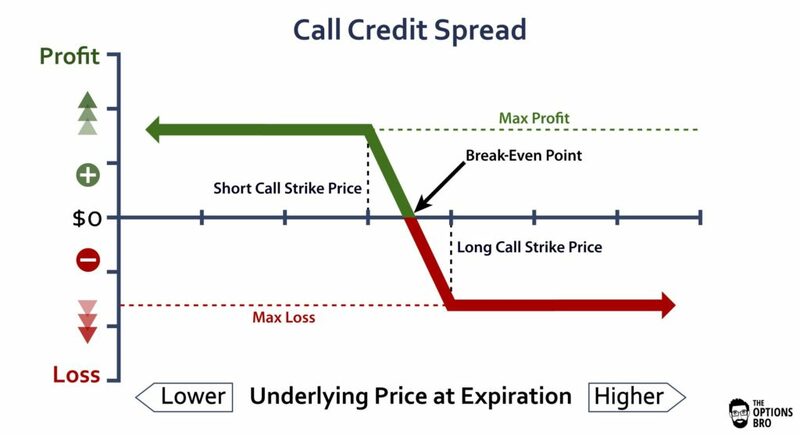 The break-even point for a call debit spread is always equal to the premium spent added to the strike price of the long call. For stock XYZ, the break even is $53.30. If XYZ is not $3.30 higher by the time of expiration, the debit spread will be a losing trade. Why Trade Call Debit Spreads? Generally speaking, you would only use the call debit spread option strategy if you are bullish on the underlying asset. Since it takes a rally in the underlying asset for call debit spreads to be profitable, this is NOT a neutral or bearish options trading strategy. Another reason to use the call debit spread option strategy is efficacy. Call debit spreads are an effective way to go long any asset and only use a fraction of the capital required to purchase the underlying asset outright. Protection from a collapse in volatility is another reason why traders like call debit spreads. If volatility in stock XYZ got completely crushed, even if XYZ didn’t move down, the volatility crush alone would devastate a long call position. Because a call debit spread has the same number of short call contracts as it does long call contracts, changes in volatility are theoretically negligible. This is the key difference between single options positions and debit/credit spreads. Theta decay for the call debit spread option strategy is detrimental. If the underlying does not appreciate in value, the trade will theoretically lose money. With that said, theta decay is a known certainty, yet if all call debit spreads expired totally worthless, everyone would simply sell credit spreads (the opposite of a debit spread). But the fact is that every debit spreads doesn’t expire worthless due to theta decay. In fact, because there are so many different options expirations on so many different assets, you can place a call debit spread with several months to go until expiration and theta decay will have less of an impact on the trade. When Should I Close a Call Debit Spread? Theoretically, you should close out a call credit spread before expiration if the value of the spread is equivalent (or very close) to the width of the strikes, i.e. if the spread has reached its max profit. If the spread has already reached its max profit, the only possibility left for the trade is to lose money via a decline of the underlying price. Therefore, it’s always a good idea to close out a winning position if the profit is defined, as it is for a call debit spread. At expiration, it’s important to note that if both legs of the spread (the long call and the short call) expire in-the-money, the value of the spread is the difference between the strike prices. It’s common to have a call debit spread trade in-the-money around the time of expiration for less than the value of the width of the strikes. Meaning, if you wanted to close out the trade early and take your profits in case the underlying asset sells off, you would only be able to do so for less than intrinsic value. This also depends on the underlying asset, because some are far more liquid than others. The one undesirable aspect of all options spreads is the possibility of the underlying asset expiring between the strike prices of the long and short options. If this happens, the outcome of your position depends on the underlying asset. If the asset is cash-settled, like SPX and other indices, you have nothing to worry about for a call debit spread. The assignment and subsequent exercise of the long call will be completed via a cash transaction. If the underlying asset is a stock, you will be assigned 100 shares for every long ITM call. This is never a problem when you are also assigned 100 short shares for every short ITM call. However, the problem is when the short call component doesn’t expire ITM. If you do not have enough money to cover the potential long call assignment the day of expiration, your options broker will likely reach out to you and ask you to close the position. It’s not a big deal if this happens. The worst possible outcome is a margin call. All that will happen is you end up being long more shares than you can hold in your account and you sell them ASAP when the market opens on the following day. A margin call will probably be issues but it is very easy to rectify by selling the shares. The possibility of a stock expiring between the strikes of a call debit spread should not be enough of a reason to eschew the strategy all together. With proper risk management, the position can easily be handled and this type of risk can be avoided all together. It is the duty of an active trader to monitor all expiring options positions; it’s never wise to solely rely on your broker to remind you. The call debit spread option strategy is a nifty options trading strategy. As mentioned above, options spreads are always interesting trades, because all spreads have a very small correlation (if any at all) to volatility changes. This is one of the reasons why the call debit spread option strategy is so popular. There is no need to worry about changes in volatility, which usually don’t happen with upward underlying moves, anyway. Plus, the risk reward is usually close to 50/50 if the debit spread is traded at-the-money or right out-of-the-money. The most important thing to remember about the call debit spread strategy is that it is strictly a bullish strategy. If the underlying asset doesn’t rise prior to expiration, the trade will not produce a profit. Ally Invest is the cheapest broker for call debit spreads. Up to $3,500 cash bonus + commission free trades for new accounts.